It’s my 25th birthday today! To celebrate, here’s another giveaway for you my dear dear readers. If you’re hitting the beach any time soon, you’ll love this giveaway! 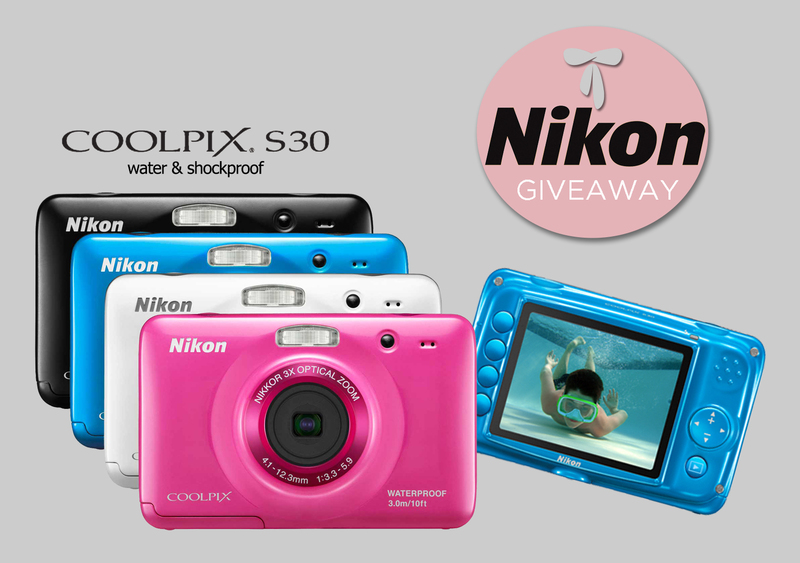 Win a Nikon Coolpix S30 camera! It’s waterproof and shockproof so you can take this little baby with you everywhere! Nikon says you can drop it, toss it and throw it into the pool and it’ll survive! It can go as deep as about 9.8 feet (3 meters) underwater and still be able to create photos and movies. As for being shockproof, you can drop this camera to about 2.6 feet. Perfect for your summer trips, right? Don’t you just love me? Like Nikon Philippines on Facebook. Deadline for entries is on April 29, 2013 at 11:59PM. This contest is open to Philippine residents only. I’ll pick a semi-finalist from the comments below using Random.org and another semi-finalist from Twitter by searching the hashtag #ItsCamilleCoGiveaways. The winner between the 2 semi-finalists will then be chosen through another round of Random.org. This means you CAN do step #4 multiple times but for step #3, please leave a comment here only once. The winner will then be announced at the comments section below on April 30. I think it’s a good waterproof camera for kids. Congrats Jovelyn.. Ur so lucky! I really want to have a camera.. Ms. Camille more nikon giveaway please..
Congrats. So lucky naman. Sana next time manalo rin. Belated Happy Bday Ms. Camille.. Happy birthday Ms. Cams!You are truly an inspiration and blessing, I hope you keep on motivational posts. Happy birthday Ms. Camille. More blessings and Have a great one! Thanks Ms. Camille for the chance. Like Nikon Philippines on Facebook: check! What a great great giveaway, I love your giveaways! thankyou & more power! godbless! By the way. Happy Birthday camille. Wish you not a beautiful but the best future to come:). Happy birthday to the most fashionable, Pretty inside and out I have known sa mundo ng blog industry!!! Happy happy birthday to the princess of all blog! I LOVE YOU SO MUCH! Hey Camille, you’re definitely one of my favorite fashion bloggers and I appreciate it that you really find time to reply and thank your readers, that is but a simple yet sweet gesture from you to us, your avid readers. I really hope to win this camera ‘coz it will be perfect to capture some moments of our short-term mission trip and sort of summer get-away in Vietnam this May. Happy birthday and thank you for sharing your blessings with us! Thanks Marianne! :) Good luck! FIRST OF ALL: Happy Birthday! :) I wish you good health and all the love in the world. Happy birthday, please continue to be pretty inside and out! belated happy birthday stunning, ms. camille! Liked Nikon Philipines on Fb, followed you on tweeter and bloglovin and already tweeted about the giveaway. Hope to win! Hope to win this! Love camera so much! Well, advance happy 25th birthday idol! we have the same birth month. awesome! =”) happy birthday Ms. CC ! Happy Birthday! :D God Bless you!